This article is about scientific observatories. 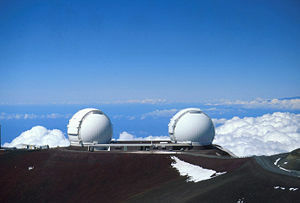 The twin Keck telescopes atop Mauna Kea, Hawaii, form one of the most important astronomical observatories in the world. A scientific observatory is a structure or place that is equipped to conduct observations of terrestrial events or celestial events or both. Observatories have been constructed for such disciplines as astronomy, meteorology, geology, oceanography, and volcanology. Some historical observatories were as simple as containing astronomical sextants for measuring the apparent distances between stars. Observatories have been enormously useful in advancing scientific knowledge and providing practical benefits. For instance, astronomical observatories have revealed amazing details about distant celestial bodies and phenomena such as star birth, star death, cosmic rays, X-ray emissions, gamma ray bursts, and expansion of the universe. Volcano observatories have been monitoring volcanic activity before, during, and after eruptions, expanding our knowledge of geophysical phenomena and issuing warnings during periods of volcanic unrest. The Paranal Observatory is Chile is home of the Very Large Telescope, a cluster of four large (8.2 meter diameter) telescopes. Modern ground-based astronomical observatories, located on the surface of Earth, are equipped with telescopes that allow observations in the radio frequency and visible light regions of the electromagnetic spectrum. Most optical telescopes are housed within a dome or other similar structure to protect the delicate instruments from the elements. Telescope domes contain a slat or other opening in the roof that can be opened during observations and closed when the telescope is not in use. In most cases, the entire upper portion of the telescope dome can be rotated, allowing the observer to point the instrument to different sections of the night sky. Radio telescopes, by contrast, usually do not have domes. For optical telescopes, most ground-based observatories are located far from major population centers to minimize the effects of light pollution. The ideal locations for modern observatories are sites at high elevations with dark skies, dry air, and a high percentage of clear nights each year. At high elevations, the Earth's atmosphere is thinner, thereby minimizing the effects of atmospheric turbulence and resulting in better "astronomical seeing". Sites that meet the above criteria for modern observatories include the southwestern United States, Hawaii, the Andes Mountains, and parts of Australia. Major optical observatories include Mauna Kea in Hawaii, Roque de los Muchachos Observatory in the Canary Islands, Paranal Observatory in Chile, and Kitt Peak Observatory in Arizona (United States). The largest observatory in the equatorial belt is Observatorio Nacional de Llano del Hato in Venezuela. 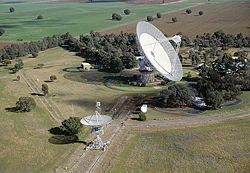 The Parkes radio telescope in Australia. Beginning in the 1930s, radio telescopes have been built for use in the field of radio astronomy. A radio observatory includes one or more such instruments, with outbuildings for such things as control centers, data reduction centers, and maintenance. Like optical observatories, radio observatories are located far from major population centers, to avoid electromagnetic interference (EMI) from radio, TV, radar, and other EMI-emitting devices. Unlike their optical counterparts, however, radio observatories are placed in valleys to further shield them from EMI. Some major radio observatories are located at Socorro in New Mexico (in the USA), Jodrell Bank in the UK, Arecibo in Puerto Rico, and Parkes in New South Wales, Australia. 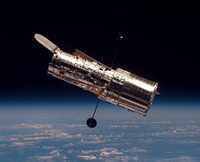 The Hubble Space Telescope, a space-based observatory. Space-based observatories are telescopes or other instruments located in outer space, many in orbit around the Earth. They can be used to observe astronomical objects at wavelengths of the electromagnetic spectrum that cannot penetrate the Earth's atmosphere and are thus impossible to observe using ground-based telescopes. The Earth's atmosphere is opaque to ultraviolet radiation, X-rays, and gamma rays, and partially opaque to infrared radiation. Therefore, observations in these portions of the electromagnetic spectrum are best carried out from a location above our planet's atmosphere. Moreover, because of their location above the Earth's atmosphere, the images obtained by space-based telescopes are free from the effects of atmospheric turbulence that plague ground-based observations. As a result, the angular resolution of space telescopes such as the Hubble Space Telescope is often much smaller than a ground-based telescope with a similar aperture. All these advantages, however, come with a price. Space telescopes are much more expensive to build than ground-based telescopes. Due to their location, space telescopes are also extremely difficult to maintain. The Hubble Space Telescope can be serviced by the Space Shuttle, but many other space telescopes cannot be serviced at all. Far East's oldest astronomical observatory constructed between 632 and 646 in Cheomseongdae, South Korea. A volcano observatory is an institution that conducts research and monitoring of a volcano. Each observatory provides continuous and periodic monitoring of the seismicity, other geophysical changes, ground movements, volcanic gas chemistry, and hydrologic conditions and activity between and during eruptions. It also provides a detailed record of eruptions in progress. These observations serve to characterize eruptive behavior, identify the nature of the precursory activity leading to an eruption, define the processes by which different types of deposits are emplaced, and specify the hazards that could be unleashed by each type of eruption. By direct observations of precursory signs, it is possible to anticipate eruptions. During volcanic unrest, observatories issue warnings and recommendations. They take on an advisory role for decision-making governmental civil defense agencies (such as FEMA in the U.S.) and ideally continue producing observational data. The U.S. Geological Survey (USGS) has a Volcano Disaster Assistance Program (VDAP) with mobile volcano observatories that can be deployed on demand. Underlying all observatory operations is an ongoing program of fundamental research in volcanic processes, supplemented by collaborative studies with universities, government agencies (in the U.S., for instance, with other USGS centers, and NOAA), industry, and NGOs. Such research typically includes direct interpretation of the monitoring and eruption data, and it leads to formulation of conceptual models that can be tested by theoretical or laboratory simulations of volcanic systems. Almost all volcano observatories are members of the World Organization of Volcano Observatories (WOVO). The oldest volcano observatory is the Osservatorio Vesuviano (founded in 1841) in Naples, now a part of the Italian government agency INGV. ↑ A Brief History of the Hubble Space Telescope: Why a Space Telescope? NASA. Retrieved January 13, 2008. ↑ Era of Space Telescopes Space Telescope Science Institute. Retrieved January 13, 2008. Milkyweb Astronomical Observatory Guide Worlds largest database of astronomical observatories since 2001 - about 2000 entries. This page was last modified on 17 December 2018, at 16:52.